Stadiums and sports facilities can serve as enormous actors in urban developments and in many cases, they are marketed as the primary driver of a city’s economic landscape. Efforts to attract sports franchises and to garner government support and financial backing for these projects have become rampant. Local politicians and city officials are petitioning for tax increases and accruing sizeable subsidies based on largely unsubstantiated claims that a stadium will positively impact the general health and well-being of the city. The perpetual cycle of lauding stadium developments and the officials who facilitate them has long been misguided. This issue is particularly relevant and timely because of the current climate of the sporting world, which has seen a feverous increase of political appeal and public spending to attract sports franchises with extravagant stadiums and facilities. One study indicated that by 2012, 125 of the 140 professional teams across the five major sports leagues in the United States and Canada (National Football League, National Basketball Association, Major League Baseball, Major League Soccer, and National Hockey League) had stadiums that were newly constructed or significantly refurbished since 1990. Construction costs alone for these projects totaled in excess of $30 billion, with nearly half of that being financed by public funds (Baade, Matheson, 2011 pg.3). Another study determined that between 2000 and 2010, 51 new major league sports facilities were opened using roughly $12 billion in public funds for construction. (Long, 2013 pg. 4). Although these exponentially increasing investments are being claimed as revitalization initiatives by municipalities, we must consider the unintended implications of these stadiums. Over the last several decades, the impact of a sports stadium has been the focus of many economic and real estate analyses. The primary objective of these studies is often to gauge the residual effects that a stadium and its associated sports franchise may have on the local economy and the housing market. This is done in an attempt to determine the accuracy of the aforementioned assertions and explain how appropriately and efficiently public funds are being spent. As it currently stands, these broad indicators are the most commonly accepted measures of a project’s success. While analyses of a city’s economy and real estate values have proven to be useful and noteworthy, they do not encompass the impact of stadiums in its entirety. The what is quite often the subject of these studies rather than the who. Lost in the effort to dispel the rumors about a stadium’s impact on economic development, is measuring its impact on the housing market. This is a facet that has equally significant implications on a city’s economy and the overall quality of life of its residents. Recognizing this knowledge gap, several specialists have attempted to gain a more comprehensive understanding of a stadium’s impact by looking at how property and real estate values are affected. (1) In support of these attempts, adaptable mathematic equations have been developed to determine this value and how it has changed over time, post-development of a stadium. These studies were based on the assumption that a house is a fixed asset, of which its price is based on factors beyond its own characteristics, which include intangibles such as access to amenities and stadiums. Because housing prices are generally spatially correlated, measuring their positive or negative impact is best done in terms of proximity to and from the stadium in question (Feng and Humphries 2008). All but two of the aforementioned studies resulted in the same conclusion – the presence of a stadium has a positive impact on real estate and property values, with a positive correlation to proximity. One of the analyses that yielded negative results was centered on a stadium for the NFL’s Dallas Cowboys. This study, however, could represent a possible outlier, because unlike the other studies that were conducted following a stadium’s establishment, this study measured property values in relation to two separate stadium proposals that were eventually delayed and scrapped. A comprehensive study by George Carlino and Edward Coulson looked at the housing market in every American city that had an NFL franchise between 1993 and 1999. The NFL was then widely recognized as the leading sporting league and the six-year span saw the greatest frequency of franchise relocations in NFL history. During that time, not only did rents increase by 8% across all central cities, but residents were also willing to accept 4% less in annual wages to support the development of sporting facilities for these franchises. Carlino and Coulson deemed this to be an overall improvement in quality of life beyond simple economic measurements. An improvement in the housing market simply implies that real-estate values have increased. While this is largely seen as a success for the city, it ignores deeper questions that surround housing affordability and availability. With New York City at the apex of the hyper-commodification of housing, understanding one of the variables that contributes to this can help planners take a step forward in efforts to facilitate neighborhood equity. Often, stadiums are established in the central or downtown regions of cities, where low-income populations typically reside. The real estate value hike attributable to stadiums leave these vulnerable populations at a greater risk of displacement. This indirect displacement is exemplified in the Prospect Height neighborhood close to the Barclays Center and greater Pacific Park development in Brooklyn, New York. (2) Significant real estate speculation resulted from the increase in Units Authorized by New Residential Building Permits from 2000 to 2015, Units Issued New Certificates of Occupancy from 2000 to 2015, Index of Housing Price Appreciation from 2000 to 2015 in conjunction with apparent commodification by surges in Median Rent within Prospect Heights (compared to Brooklyn borough level and New York City level). As a result, this phenomenon facilitated a housing market that priced out many pre-existing residents. This time and location-based cross-reference of data, indicates at least some level of correlation between the Barclays Center project and the diminishing affordability of surrounding neighborhoods. Stadium construction in this instance, which was initially advertised as a community-improving endeavor, was done at the expense of the vulnerable, low-income population that originally inhabited this neighborhood. These local residents were essentially rendered unable to keep up with the increasing real estate trends. By looking closer at the data in these examples and analyzing deeper layers of what deceptive economic and real-estate impacts can mean for actual local people, we see that stadiums often can become a massively powerful gentrifying force. It is therefore critical to bridge this knowledge gap and explore externalities such as who is truly impacted by stadium construction and if those impacts are positive ones that are universally realized. In doing so, and assuming a more comprehensive approach, planners can better promote inclusive policy making decisions. Spatz, Alex. 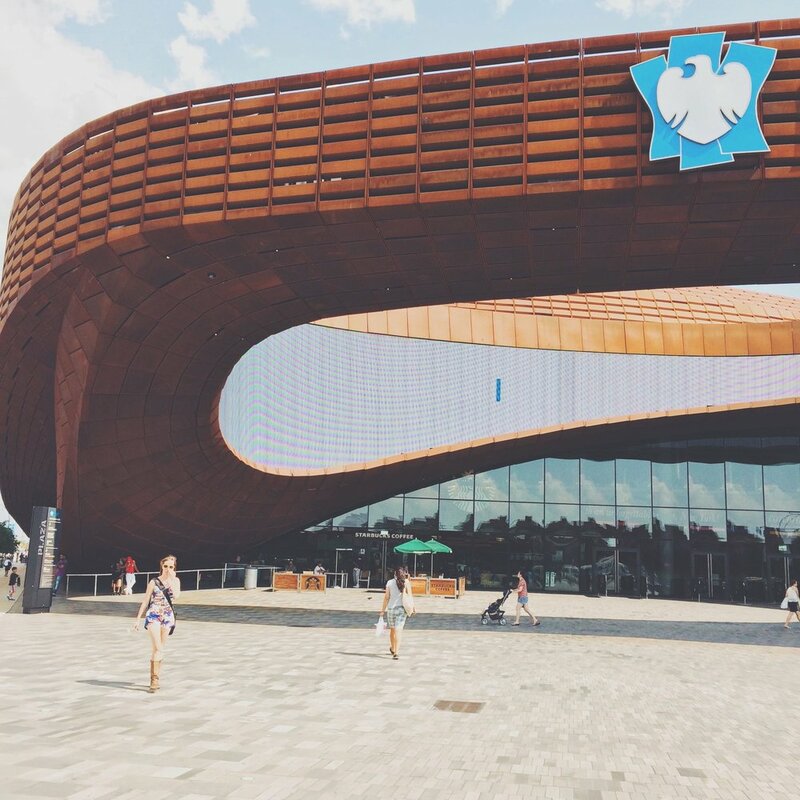 “Stadium Construction and the Surrounding Communities: A Housing Equity Impact Analysis on the Barclays Center and Prospect Heights.” Brooklyn, NY / Pratt Institute, Library of Pratt Institute, 2017, pp. 1–84. Alex is a policy advisor and consultant for the United Cities and Local Governments. As part of this position he advocates for the involvement of local governments and empowerment of local constituents within global agendas at the UN. He also works on policies promoting sustainable urban development across the world for a healthier, inclusive future. Alex is a graduate of Pratt Institute’s City and Regional Planning program where he performed an equity impact analysis of the Barclays Center stadium and studied its impact on housing affordability and displacement as part of his thesis.